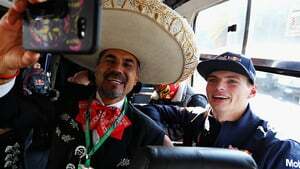 There were the traditional pre-Mexico activities going on this past weekend, with many drivers spotted out and about with sombreros on. I'm handing out points for other things though, such as playing football against your teammate, revelling in your brand new F1 number, celebrating your pets and much more. Formula One has crowned its championship for this season, but there's still plenty to play for in the battle for Christine's Rankings. Ricciardo has a healthy lead, but there are still a few weeks left - so do let me know if you spot anything that needs points added on or taken away. This is your moment! +1 Lewis Hamilton: I'm just going to believe that they ARE texting each other. +1 Valtteri Bottas: I'm just going to believe that they ARE texting each other. +1 Fernando Alonso: More extra-curricular racing for Alonso as he plans a busy start to 2018. +1 Sergio Pérez: Spot of football for Checo and Esteban ahead of the Mexican Grand Prix. +1 Esteban Ocon: Spot of football for Checo and Esteban ahead of the Mexican Grand Prix. -1 Max Verstappen: Not really a fan of the cocky attitude post-race. +1 Sebastian Vettel: Vettel's reaction to pole position does make me chuckle. +1 Valtteri Bottas: Airborne tour of Mexico City looks a lot of fun! +1 Brendon Hartley: Love a bit of nostalgia from drivers, but even more so that he has a numbers/alphabet revelation. +1 Lance Stroll: Cake and more! +1 Fernando Alonso: This cat looks weird. +2 Sergio Pérez: Love his trip to the podium just to say hi to the fans. +2 Max Verstappen: Max takes the bus and even buys some food whilst on board!